If you were really honest with yourself, you’d probably say that you want more money, you want to be happier and you want more fulfillment. This is what we ALL want. Ultimately, you want to do what you want, when you want, with whom you want. A life with no restrictions, Right? If you want any of the above – keep reading because what you’re about to discover is different than anything you’ve experienced before. It is true that Bob Proctor has helped change the lives of millions on a global scale – teaching them how to BE, DO and HAVE more – how to attain wealth, health and happiness that is lasting … and he can do the same for YOU through his seminars, books and recordings. When he works with you, 1-on-1, with all of his focus on you, what you want, your plan, your objective, the effectiveness increases exponentially. Keep in mind, he is the only living master from the historical Carnegie, Hill, Nightingale lineage, and is known around the world as the greatest prosperity teacher of our time. This is a true once-in-a-lifetime opportunity. This is not your average event, the other participants will be anything but average, and the results you get from attending this event will be truly extraordinary. The purpose of the 3% Symposium is to move you onto the fast track to the top 3% in the world with your income—so you can be, do and have everything YOU really want. Setting. This is an intimate setting with a maximum of 20 attendees who are all serious students looking to make quantum leaps. You’ll have the rare opportunity to be coached live, one-on-one by Bob in a very small group setting and you will participate in Bob coaching the others in the group where you can have even bigger break-throughs than in the one-on-one coaching. Contacts. When you want to make big moves – sometimes it is all about who you know. At this event Bob gives you a peek inside his rolodex – for your benefit. Accountability. You can look forward to leaving the event with action steps, dates and a real sense of accountability – something necessary for any degree of success. Networking. 2 minds are greater than 1. So, just think what a difference having a group of elite individuals focused on improving your business and life will make. Expansive Library. You will receive an expansive library of Bob’s material. Custom Video of You and Bob. You will receive a custom video of you and Bob to jump start your idea into action. And of course you’ll also be getting step-by-step guidance from the master thinker and achiever himself. Think of this like Google Maps for your dreams and goals. Help you create TRUE freedom – time and money. Fulfill your life purpose and bring you true fulfillment. Give you the contacts to bring any idea to life. Allow you to be, do and have more. You will spend these three days crystallizing an aggressive move forward, and cementing an exact plan to get where you want to be. We ALL want more out of life … More money, more happiness, more fulfillment – join Bob for 3 days, and he’ll show you how to achieve more for a lifetime. There are only 20 spots available – and they’re going to go fast … on a first come first serve basis. Bob is the heir to the legacy of the modern science of success that began with the financier and philanthropist Andrew Carnegie. Carnegie’s great challenge to the young reporter Napoleon Hill to discern a formula for success fueled Hill’s creation of the renowned book Think and Grow Rich. Earl Nightingale read Think and Grow Rich, became Hill’s protégé, and became wealthy enough to retire at age 35. People asked Nightingale how he was able to do what he did, so he condensed Think and Grow Rich and recorded it on a record. Bob read Think and Grow Rich and listened to Nightingale’s recording thousands of times before working as Nightingale’s protégé for five years. He has since taught millions how to live their lives in harmony with the universal laws to achieve extraordinary success. As a speaker, author, consultant, coach, and mentor, Bob Proctor works with business entities and individuals around the world, instilling within them not only the mental foundations of success and the motivation to achieve, but also the actionable strategies that will empower them to grow, improve, and thrive in today’s ever-changing world. Through the Proctor Gallagher Institute, Bob, Sandy Gallagher, and their team teach the principles, strategies and fundamentals that help people and organizations create the results they want in life. 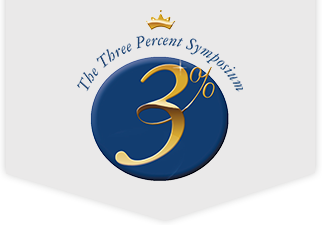 SO, WHAT EXACTLY IS THE 3% SYMPOSIUM? The 3% Symposium is an intensive and intimate 3-Day LIVE Event with Bob Proctor in Toronto, Canada. At this event you’ll have 1-on-1 time with Bob to develop, crystalize and make serious progress on your goals and business – as well as mastermind with and gain resources from the other 19 individuals present. WHY GO TO THE 3% SYMPOSIUM? The 3% Symposium is not for everyone. THe 3% Symposium is only for our most serious students who are ready to make gigantic steps forward in their lives - and willing to do what it takes to make it happen. HOW DO YOU KNOW IF THE 3% SYMPOSIUM IS RIGHT FOR YOU? Are you ready to live a life unbound? Are you ready to specialize in the impossible? Are you ready to turn your wildest dreams into an exact plan of action? For pricing, more details and to find out if the 3% Symposium is a good fit for you fill out the form below to be contacted by a Proctor Gallagher Training and Coaching Coordinator. Are You Willing to Invest In Yourself?